We need to stop the chemtrail spraying of San Bernardino County and the entire state of California ASAP! Chemtrails, Chemical trails or Aerosol spraying, are a very real threat to San Bernardino County, and humanity on a global scale and must be stopped.
" As we passed on Hwy 18 from Adelento to Victorville, we passed a massive building next to the old abandoned Victorville Airforce station. We had been observing this for miles and at first thought the white pointy things in front of it was a solar array. However, as we passed it it became obvious they were planes, many, many planes, resembling domestic airplanes, but no windows, and varied tail colors, but no other markings. I think I know one point of origin of the mysterious cobweb planes. The sign in front of the closely guarded entrance read: Global Access: Southern California Logistics Research. " Hmmm...VERY interesting! GLOBAL ACCESS, eh? Does anyone out there know any more about this? 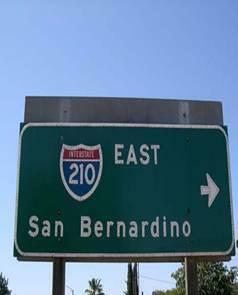 Anyone living around the San Bernadino, Victorville, Barstow Area? Would love to know just what "Global Access" and "Southern California Logistics Research" means in Government double speak! Nov 05, 2009 . Ever felt you were being sprayed like an insect? This was taken by my daughter while she was out today. What's going on? Taken in Yucaipa CA. Appx. 6-745 pm Sun. July 26, 2009. Temp.90, DP 54, Hum. 29, Wind 9 WSW, Bar 29.96 rising. Chemtrails. Southern California. Slammed. October 9, 2009. Lovely day here in the IE. Sprayed. Southern California Chemtrails Fall 2009. Ceaseless.